A real time MBF monitoring system has been succesfully implemented at the Franeker municipal waste water treatment works operated by Wetterskip Fryslan in the Netherlands. The system has been developed in close collaboration with Brightwork (www.brightwork.nl) and allows the operators to continuously monitor the actual filter operational status: "Installing SandCycle showed to be the best way to get the most out of my continuous sand filters. Clear dashboards show extremely effective to optimize filter operations. Direct savings are now at hand". The monitoring system may be applied at all continuous sand filter plants: e.g. AquaBiofilter, AstraSand, DynaSand, HydraSand etc. 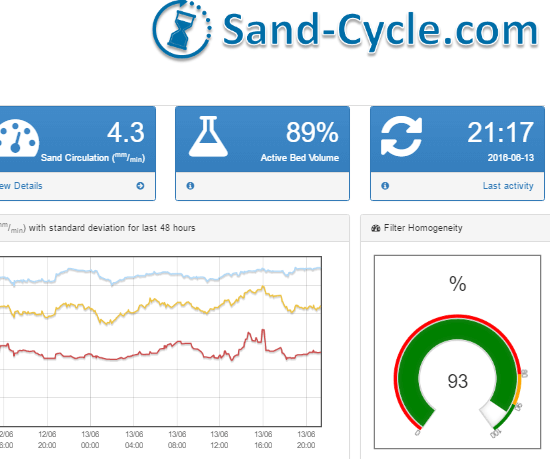 Please visit Sand-Cycle.com for more information.